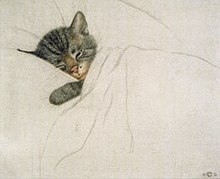 Guido Gruenwald's original etching of a sleeping kitten, from which Chessie originated. Chessie on a 1940s timetable. 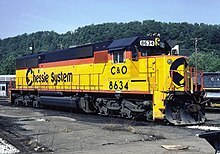 A Chessie System locomotive, bearing the simplified Chessie logo. Chessie was a popular cat character used as a symbol of the Chesapeake and Ohio Railway (C&O). Derived from an etching by Viennese artist Guido Gruenwald, the image first appeared in a black and white advertisement in the September 1933 issue of Fortune magazine with the slogan "Sleep Like a Kitten." The advertisement makes no mention of the cat's name. Dixon, Jr., Thomas W. (1988). Chessie the Railroad Kitten. TLC Publishing. ISBN 978-0-9622003-1-1. This page was last edited on 25 July 2018, at 03:42 (UTC).